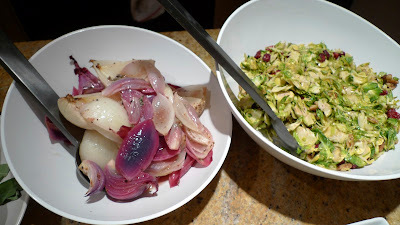 If you haven't noticed, I've been making quite a bit of brussels sprouts lately. It may have to do with one of my friends Aleen being a huge fan of them so whenever I am having friends over, including her, I tried to make some sort of brussels sprouts dish for her. She mentioned that she had shaved brussels sprouts at a restaurant in NY so I thought I'd try something along those line this time. I found a great recipe on Foodnetwork that I decided to try. Here's the finished product. I have to admit, I was weary of how this would turn out, but it was a nice change from the roasted brussels sprouts I was used to having. It was definitely more light and vibrant in flavor. Shred the Brussels sprouts by removing the core and thinly slicing. Warm the olive oil in a large skillet over medium heat. Add the Brussels sprouts, nutmeg, and salt and pepper, to taste. 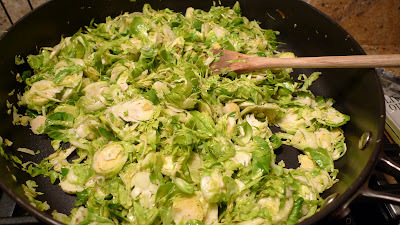 Cook, stirring, until the Brussels sprouts are bright and slightly wilted, about 2 to 3 minutes. 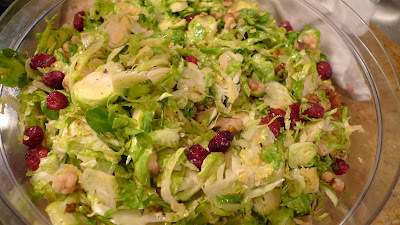 Add the walnuts and the cranberries and toss to combine. Turn out into a serving bowl and serve warm. It's super easy to make and everyone loved it. omg, can i tell you.. I went to 'Father's Office' in Culver City with the girls... and we ordered brussel sprouts. I was like, um,, don't like brussel sprouts.. but they were SOOOO good. I might be a fan now. I'm so jealous! I'm glad you tried brussel sprouts, they are so yummy and easy to make at home too!